Evgeni Plushenko performs his Short Program at the 2013 Russian National Figure Skating Championships. Evgeni Plushenko has taken the first step towards winning his tenth national title at the 2013 Russian National Figure Skating Championships in Sochi. He won the Men’s Short Program event by finishing four points ahead of Sergei Voronov. Maxim Kovtun is currently third. On the paper, Plushenko’s performance does not look all that impressive: only a quad-double combination and no level four spins or step sequences. In reality however, it was a powerful reminder that no matter how many competitions he misses, the 2006 Olympic Champion still remains one of the most steadfast and reliable competitors, capable of enchanting the audience by the sheer strength of his personality. Despite much publicized collaboration with Kenji Myamoto and Pasquale Camerlengo this summer, Plushenko’s program set to a tango arrangement of Vivaldi’s Four Seasons was not markedly different from his previous routines. Some will most likely revel in this fact, while others will undoubtedly point out all well-known flaws. However, according to the skater, doing even that much was a challenge. “Naturally, there are things which I could have done better in the short program,” he admitted, “but overall I am satisfied that I have landed the quad. The judges were obviously happy with his performance as well. He posted 91.66 (44.83/46.85) points and did not receive a program component score below 9.00, picking up three 10.00 for Performance/Execution, Choreography and Interpretation from one of the judges. The student of Alexei Mishin credits intense training early in the season for his recent bout of health issues. The skater remains vague about his plans for the rest of the season. Sergei Voronov also seems to be on a comeback trail. He nailed his entertaining Sailor Dance routine, producing a quad toe loop-triple toe loop combination, a triple Axel, and triple loop out of steps. He earned 87.69 (45.98/41.71) points, and is the only competitor to have a chance to challenge Plushenko tomorrow, however theoretical this chance might be. 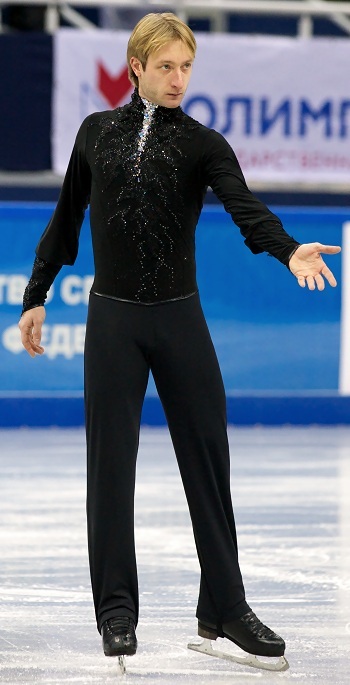 Maxim Kovtun was expected to challenge for Senior medals in Sochi. While he is nominally third, the manner in which he ended up in this position left much to be desired. The 2012 ISU Junior Grand Prix Champion fell out of his opening quad toe loop attempt and later crashed on a triple Lutz. All other aspects of his performance to music from the Lawrence of Arabia soundtrack was strong and he earned 75.38 (37.49/38.89) points to finish a distant third. The student of Elena Byuanova and Tatiana Tarasova denies that introducing the quad into his short program was a reason for mistakes. Kovtun is closely followed by four other competitors. Artur Gachinski once again was unable to produce a clean quad toe loop and triple Axel, but picked up good levels and good program components scores to finish fourth with 74.58 (35.98/39.60) points. The student of Alexei Mishin is unable to pinpoint a cause of his problems this year. Mikhail Kolyada did not attempt any quads, but his upbeat and well-choreographed routine to The Mask soundtrack featured a strong triple Axel and a good triple Lutz-triple toe loop combination. Unfortunately, the skater did not receive any credit for his final combination sit spin, otherwise he might have moved up a couple of spots (74.46). Konstantin Menshov delivered his usual hit-and-miss routine: a stumble out of a triple Axel landing was followed by a strong quad toe loop-triple toe loop combination, but then the student of Evgeni Rukavitsin fell on a triple Lutz (73.88). Artur Dmitriev fell on his opening quad, but did all other elements well (72.38). Zhan Bush struggled with his jumps (he fell out of triple Axel landing, underrotated and fell out of a quad toe loop, and received an edge call for his triple Lutz in combination with a triple toe loop). He is currently 11th with 62.60 points.